Home renovations can be exciting. You’ve likely been saving money and planning out your dream home for years now. Revamping your kitchen or making good use of a child’s old bedroom can help put a new face on your home – but it can also be stressful and eat up a lot of your time. While the actual renovation should be left up to the professionals, with your input, there are a variety of tasks you should handle pre, during and post renovation to ensure a smooth process. Renovations mean clean up. You’re going to have to get rid of all of the left over materials that you don’t need, or haven’t used, while renovating or decorating. If you know that you’ve already completed something while renovating and you have left over materials, start getting them out of the way, or recycle them as you go to save yourself time afterwards. If you know how long something is going to take you before you start, call the junk removal service ahead of time to ensure that you aren’t going to be left with piles of leftover material. As well, Instead of leaving piles of materials in each area, create one location, preferably outside or in your garage where you can pile all of your reno materials as you go. This will make it so much easier once things have finally come to a close and you need to get leftover materials out of your home. If you are renovating as part of a value-adding project before listing your house, and time is of the essence, why not get the ball rolling with your real estate agent before you have actually completed the reno. Time it so that the house will have had a little bit of market exposure while you are finishing up the project, so that once it’s done, you can start showing it immediately. It is important, however, not to give yourself too much lead time, or you risk garnering interest without being able to actually show your home. Many homeowners are unsure of how they can make for a smoother renovation, and what their role will be before, during and after the renovation. 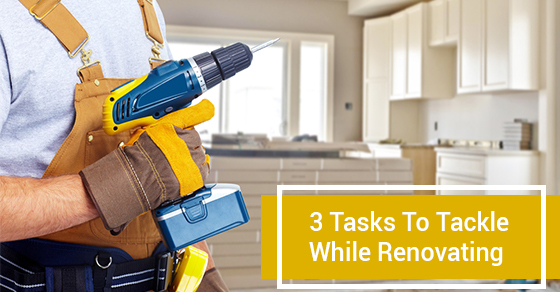 Completing the above tasks will ensure that you can hit the ground running on selling or decorating your home once the renovations are complete.